A rescued orphaned or displaced orangutan undergoes a comprehensive rehabilitation process, resembling a school process, at a rehabilitation centre before it can be reintroduced to the rainforest. Save the Orangutan supports the two rehabilitation centres on Borneo managed by BOS Foundation: Samboja Lestari and Nyaru Menteng. 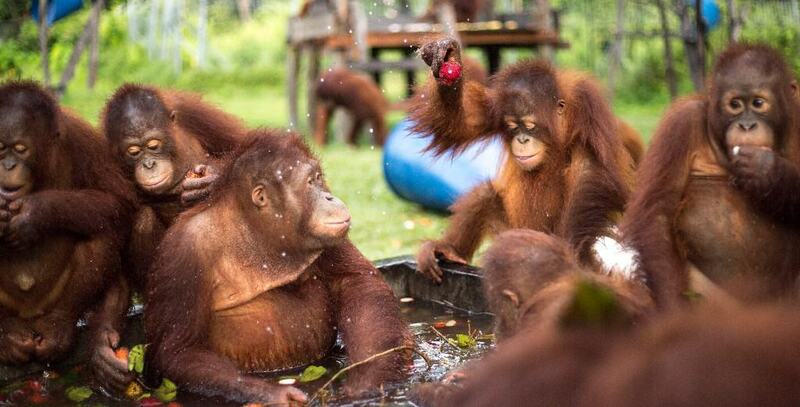 The centres currently care for more than 600 orphaned and displaced orangutans. The rehabilitation process is divided into phases, including the Baby School, Forest School I, and Forest School II. The process concludes on pre-release rainforest islands where the orangutan’s independency and skills are put to the test. After proving it has acquired the skills necessary to survive in the wild on the pre-release islands, the orangutan is finally ready to be reintroduced to the rainforest. Since 2012, more than 350 orphaned orangutans have been reintroduced to Borneo’s protected rainforests and are now enjoying their freedom. The Nyaru Menteng rehabilitation centre is located in Central Kalimantan on Borneo. It is the larger of the two rehabilitation centres managed by BOS Foundation. The centre currently cares for more than 400 orangutans at various phases of rehabilitation. Save the Orangutan’s support to the centre covered more than 80 percent of its operating costs in 2017. 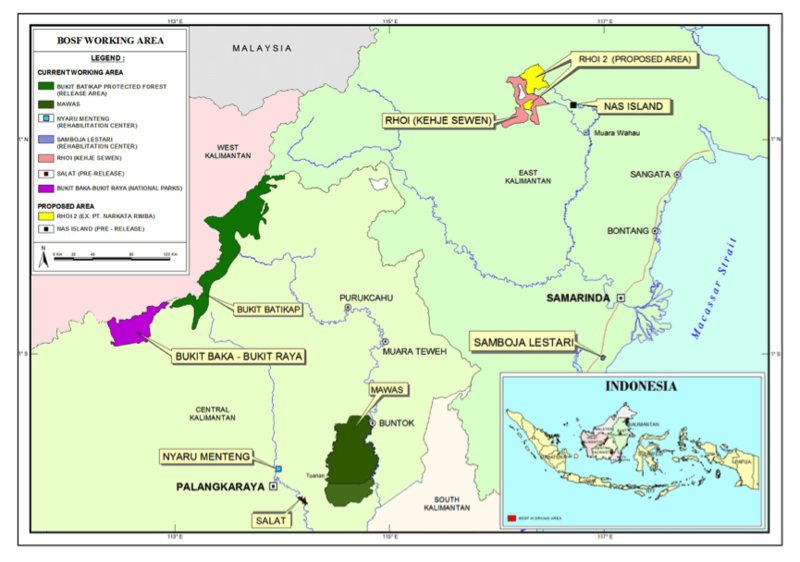 The Samboja Lestari rehabilitation centre is located in East Kalimantan on Borneo. The centre currently cares for approximately 200 orangutans in various phases of rehabilitation. At the rehabilitation centres, the young orangutans undergo a comprehensive rehabilitation process in which they gradually acquire the skills necessary to survive on their own in the rainforest. The rehabilitation process takes the orangutans through the various phases of development a wild orangutan would go through if it grew up in the rainforest with its mother. If the rescued orangutan is younger than three years old, it begins its preparation for life in the rainforest in Baby School. Here, the orangutan is assigned a personal babysitter, functioning as a surrogate mother, who cares for the orangutan and creates a safe and secure environment. The infant orangutans sleep in baskets, and they are taken to a nature reserve to develop their motor skills on a daily basis. When the orangutans reach the age of two, their daily milk is supplemented with cut up fruit, and they gradually begin to practise their nesting skills. They acquire most of the skills by observing the behaviour of older orangutans and copying them. The rescued orangutans from Baby School progress through Forest School. Forest School is divided into different classes depending on the orangutans’ age and skills. In Forest School I, the orangutans are typically aged 3-5 and in Forest School II, they are typically aged 5-7. The food is no longer pre-cut in Forest School, and the orangutans gradually become more independent. In Forest School II, the female babysitters are replaced by male technicians, acting more like teachers than surrogate mothers. The orangutans begin exploring forested areas on their own, and they begin to forage their own food, build nests, climb high trees, and decode danger signals. Once they have acquired all of these crucial skills, they are ready to be moved onto one of the pre-release rainforest islands. When an orangutan reaches the age of eight and has demonstrated the necessary skills, it will be moved to a rainforest island where it lives like a wild orangutan with limited human contact. On the pre-release islands, the orangutans are to forage most of their food on their own. However, the orangutans receive a supplement of fruits since the islands cannot produce enough fruit for all its orangutans. At the least, the orangutans must demonstrate they have acquired the skills necessary to survive a drought and a rainy season before they are ready for a complete reintroduction to the rainforest. Nyaru Menteng manages five protected rainforest islands, covering between 15 and 100 hectares: Kaja, Palas 1, Palas 2, Hampapak, and Bangamat. Additionally, the centre manages Salat Island, which became a pre-release rainforest island in 2016. With over 3,000 hectares of lush rainforest, Salat Island is by far the largest of the islands and it has a carrying capacity for approximately 200 orangutans. Orangutans are grouped on the islands by gender, age, and temper. There is a natural hierarchy on the islands, and the dominant orangutans and the males, are therefore placed as far from each other as possible. Samboja Lestari manages several man-made islands, which are used as pre-release islands for the orangutans at the East Kalimantan Centre. The purpose of the rehabilitation process is to make the orphaned and displaced orangutans capable of surviving on their own in the wild. Back in 2012, the Nyaru Menteng rehabilitation centre obtained access rights to a protected rainforest area covering 350 km2. Following the obtainment of access rights, the most comprehensive reintroduction operation for great apes in history could be initiated. Today, the rehabilitated orangutans are released into three different rainforest areas in the eastern and central parts of Indonesian Borneo (Kalimantan). The rehabilitated orangutans from Nyaru Menteng are released into the Bukit Baka Bukit Raya National Park (TNBBBR), which takes 10 hours to reach, or into the Bukit Batikap National Park, which takes several days to reach. The rehabilitated orangutans from Samboja Lestari are released into the Kehje Sewen Forest, which is a nature restoration area managed by BOS RHO. The release sites are selected on the basis of a number of internationally approved guidelines and criteria. For instance, the areas must be protected, have a carrying capacity for about 300 orangutans, not already inhabit wild orangutans, and they must oversee limited human activity. The experience of reintroducing more than 350 rehabilitated orangutans to the rainforest prove that the rehabilitated orangutans do just as well in the rainforest as the wild orangutans. Additionally, several orangutan births among released orangutans prove that we can eventually establish new sustainable populations of wild orangutans in the protected forest areas. The release of rehabilitated orangutans is a huge logistical task, and it requires thorough planning and great dedication. A release also requires the involvement of local communities near the release sites. The orangutans who have completed the entire rehabilitation process and have acquired the skills necessary to survive in the rainforest are moved to the centre’s quarantine facilities. In these facilities, they undergo a thorough medical examination by a licensed veterinarian before being released. The orangutans are sedated prior to their journey to the selected release site and radio transmitters are implanted in them, which allow the centre to monitor the orangutans after their release. The orangutans are then put in transport cages in which they will make their journey to their release site. The orangutans are released in small groups that have been carefully put together based on gender, behaviour, and age. The orangutans are transported by car, boat, or helicopter to the selected release site. By requirement, these sites are very remote and far from the rehabilitation centres and they are difficult to reach. During the journey, veterinarians examine the orangutans every two hours at the least, and they ensure they have enough food and water. Once they reach the release site, the transport cages are taken into the rainforest and the orangutans are released one by one. Post-monitoring teams monitor the orangutans for the first two years after their release to ensure they can survive in the rainforest. Monitoring teams typically consist of people from local communities near the release sites, since knowledge of the rainforest is essential. Camps have been established at the release sites where the monitoring teams can stay and evaluate the collected behavioural data on the individual orangutans’ adaptation to life in the rainforest. If a released orangutan has difficulties adapting, it is brought back to the camp and examined by a veterinarian. If necessary, it will receive veterinary treatment before being released again, or it will return to the rehabilitation centre for further treatment.